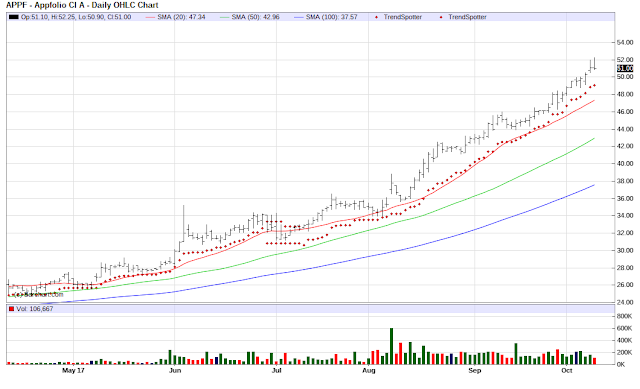 The Chart of the Day belongs to AppFolio (APPF). I know this is a repeat but it still has one of the best chart I can find and deserves to be repeated. I found the software solutions by using Barchart to sort the list of stocks hitting new 52 week highs, first by the highest Weighted Alpha then again by using the Flipchart feature to review the charts. Since the Trend Spotter signaled a buy on 7/12 the stock gained 55.02%. AppFolio, Inc. offers cloud-based software solutions for property management and legal industries. It offers AppFolio Property Manager, a solution for the property managers including activities of posting and tracking tenant vacancies, handling the entire leasing process electronically, administering maintenance and repairs with their vendor networks, managing accounting and reporting to property owners. MyCase solution for practitioners and small law firms, providing time tracking, billing and payments, client communication, coordination with other lawyers and support staff, legal document management and assembly and general office administration services. Value+ services include Websites and electronic payment services. AppFolio, Inc. is headquartered Goleta, California.